Canadian Oil Sands on Monday announced a 17% dividend increase to $0.35/share despite net income, cash flow and production all slipping in the first quarter. 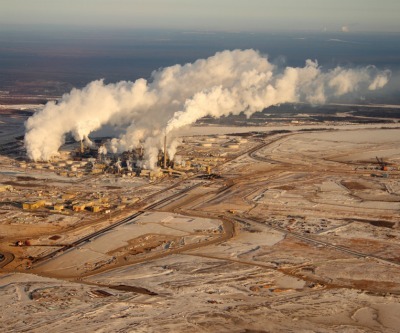 Canadian Oil Sands owns 37% of the Syncrude mine north north of Fort McMurray in Canada's western province of Alberta. The mine and attached works is the biggest operation of its kind in the world. While Q1 net income only declined by a cent a share to 66c, sales volumes were down to 108,100 barrels per day from 120,900 barrels per day during the same period of 2011. Canadian Oil Sands also reduced Syncrude's overall production estimate for 2012 to 110 million barrels or 301,000 barrels per day. The company said production in Q1 2012 was negatively impacted by maintenance on a coker unit, a crucial part in the oil sands crude upgrading process to produce a lighter more viscous oil. The company also decreased its estimate for capital expenditure by some 16% to $1.2 billion for 2012. The company is assuming a $90 per barrel plant-gate price this year, based on a $10 discount to a US benchmark price of $100 per barrel. The discount for syncrude oil, the light low sulfur form of crude after undergoing upgrading, has improved dramatically after slumping to multi-year lows in March. From a gap of $23 below US benchmark crude in the form of Nymex West Texas Intermediate (WTI) six weeks ago syncrude on Monday actually moved into premium territory. The Edmonton spot price for syncrude was last quoted at $1.50 above WTI from Friday's $1.25 discount. Western Canada Select – a blend of heavy oil sands crude and conventional oil – has also staged a dramatic recovery. The difference in price for a barrel of Western Canada Select to WTI was $14.85 below on Monday compared a whopping $35.75 discount on March 9, 2012. The last time the gap between Canadian and US crude was below $16 was in December, although it’s still way below the $8.00 discount Alberta’s oil patch enjoyed in September. Cash flow from operations was $454 million ($0.94 per Share) in the first quarter of 2012, down five per cent from cash flow from operations of $478 million ($0.99 per Share) recorded during the 2011 first quarter. The decrease was due mainly to lower sales volumes and higher Crown royalties, partially offset by a higher sales price and lower operating expenses. Net income for the first quarter of 2012 was $321 million ($0.66 per Share) compared with $324 million ($0.67 per Share) in the 2011 first quarter. COS is increasing the quarterly dividend to $0.35 per share from $0.30 per share, payable on May 31, 2012 to shareholders of record on May 25, 2012. Sales volumes averaged 108,100 barrels per day during the first quarter of 2012 compared with 120,900 barrels per day during the same period of 2011. Production in the 2012 first quarter was mainly impacted by maintenance on Coker 8-1 while the first quarter of 2011 enjoyed strong, uninterrupted operations. Operating expenses in the first quarter of 2012 decreased by a significant 17 per cent to $321 million, or $32.68 per barrel, from $387 million, or $35.53 per barrel, in the same period of 2011. The decline primarily reflects decreased purchased energy costs due to lower natural gas prices in 2012 and reduced expense for Syncrude's long-term incentive plans. "The increase in the dividend to $0.35 per share reflects confidence in our business fundamentals and the commitment to delivering excess cash to our investors," said Marcel Coutu, President and Chief Executive Officer. "Continued strength in oil prices and Syncrude's solid operating base generated strong revenues, resulting in a growing cash balance over the first quarter. Combined with our recent US$700 million debt issuance, we have the liquidity to fund our major capital projects over the next few years while maintaining a strong balance sheet and dividend. Net debt levels are expected to gradually rise to more normalized levels of $1 billion to $2 billion by the end of 2014, which is coincident with the expected completion of our major projects, followed by a much reduced capital expenditure profile and higher free cash flow expected thereafter. While market prices for energy stocks are disappointing, currently our financial strength is at historic highs and our dividend yield remains among the most compelling in the sector." (1) Cash flow from operations and cash flow from operations per Share are non-GAAP measures and are defined on page 5 of the Management'sDiscussion and Analysis ("MD&A") section of this report. (2) The Corporation's sales volumes differ from its production volumes due to changes in inventory, which are primarily in-transit pipeline volumes. Sales volumes are net of purchases. Syncrude produced an average 295,000 barrels per day (total 26.8 million barrels) during the first quarter of 2012 compared with 321,000 barrels per day (total 28.9 million barrels) during the same 2011 period. Production in the 2012 first quarter was impacted by maintenance on Coker 8-1 while the 2011 first quarter was characterized by more reliable operations with no major maintenance. Coker 8-1 returned to service in April at full capacity rates. We have reduced our single-point 2012 Syncrude production estimate to 110 million barrels (40.4 million barrels net to Canadian Oil Sands) or 301,000 barrels per day (111,000 barrels per day net to Canadian Oil Sands). The 2012 Syncrude production range has been narrowed to 106 to 114 million barrels. The 110 million barrel Syncrude production outlook incorporates actual first quarter 2012 production, a planned turnaround of Coker 8-3 during the second quarter of the year, and an allowance for unplanned outages. COS is assuming a $90 per barrel plant-gate realization, based on a U.S. $100 per barrel West Texas Intermediate ("WTI") oil price and a $10 per barrel SCO discount to Canadian dollar WTI. We are estimating 2012 operating expenses of $1,529 million, or $37.83 per barrel, reflecting a natural gas price assumption of $3.00 per gigajoule. The estimate for 2012 capital expenditures has decreased by $241 million to $1,219 million due to timing adjustments of major project spending. The expected completion dates and estimated costs for the major projects are not affected. We anticipate recording no current taxes in 2012 and approximately $400 million of current taxes in 2013 based on the assumptions in our outlook. The increase in estimated 2013 current taxes reflects adjustments to the expected timing of capital expenditures and related tax deductions. We are estimating 2012 cash flow from operations of $1,641 million, or $3.39 per Share. After deducting forecast 2012 capital expenditures, we estimate $422 million in remaining cash flow from operations for the year, or $0.87 per Share. More information on the outlook is provided in the Management's Discussion and Analysis ("MD&A") section of this report and the April 30, 2012 guidance document, which is available on our web site at www.cdnoilsands.com under "Investor Information". Canadian Oil Sands' Annual General Meeting of Shareholders will be held today, April 30, 2012 at 2:30 p.m. (Mountain Daylight Time) in the Ballroom of The Metropolitan Conference Centre, 333 Fourth Avenue SW, Calgary, Alberta. A live audio webcast of the meeting will be available on our website atwww.cdnoilsands.com. An archive of the webcast will be available approximately one hour following the meeting. The following Management's Discussion and Analysis ("MD&A") was prepared as of April 30, 2012 and should be read in conjunction with the unaudited consolidated financial statements and notes thereto of Canadian Oil Sands Limited (the "Corporation") for the three months ended March 31, 2012 and March 31, 2011, the audited consolidated financial statements and MD&A of the Corporation for the year ended December 31, 2011 and the Corporation's Annual Information Form ("AIF") dated February 23, 2012. Additional information on the Corporation, including its AIF, is available on SEDAR at www.sedar.com or on the Corporation's website at www.cdnoilsands.com. References to "Canadian Oil Sands" or "we" include the Corporation, its subsidiaries and partnerships. The financial results of Canadian Oil Sands have been prepared in accordance with Canadian Generally Accepted Accounting Principles ("GAAP") and are reported in Canadian dollars, unless stated otherwise. In the interest of providing the Corporation's shareholders and potential investors with information regarding the Corporation, including management's assessment of the Corporation's future production and cost estimates, plans and operations, certain statements throughout this MD&A and the related press release contain "forward-looking information" under applicable securities law. Forward-looking statements are typically identified by words such as "anticipate", "expect", "believe", "plan", "intend" or similar words suggesting future outcomes. Forward-looking statements in this MD&A and the related press release include, but are not limited to, statements with respect to: the expectations regarding the 2012 annual Syncrude forecasted production range of 106 million barrels to 114 million barrels and the single-point Syncrude production estimate of 110 million barrels (40.4 million barrels net to the Corporation); the timing and impact on production of the turnaround of Coker 8-3; future dividends and any increase or decrease from current payment amounts; the expectation that the Corporation can support a higher dividend level while maintaining a strong balance sheet. The establishment of future dividend levels with the intent of absorbing short-term market volatility over several quarters; the level of natural gas consumption in 2012 and beyond; the expected sales, operating expenses, Crown royalties, capital expenditures and cash flow from operations for 2012; the anticipated amount of current taxes in 2012 and 2013; the expectation that proceeds from the March 2012 senior note offering will be used to repay U.S. $300 million of senior notes which mature on August 15, 2013, fund major capital projects over the next three years and support dividend stability; expectations regarding the Corporation's cash levels over the next several years; the expected price for crude oil and natural gas in 2012; the expected foreign exchange rates in 2012; the expected realized selling price, which includes the anticipated differential to West Texas Intermediate ("WTI") to be received in 2012 for the Corporation's product; the expectations regarding net debt; the anticipated impact of increases or decreases in oil prices, production, operating expenses, foreign exchange rates and natural gas prices on the Corporation's cash flow from operations; the expectation that regular maintenance capital costs will average approximately $10 per barrel over the next few years; the expected amount of total major project costs and anticipated target in-service dates for the Mildred Lake mine train replacements, the Aurora North mine train relocations and the composite tails plant at the Aurora North mine; the anticipated target in-service date for the Syncrude Emissions Reduction ("SER") project; the expectation that the SER project will significantly reduce total sulphur dioxide and other emissions; the expectation that the Corporation will finance the major projects with cash flow from operations and the planned increase in net debt levels; the cost estimates for 2012 major project spending and post-2012 major project spending; the expectation that the WTI discount to Brent oil prices will narrow as pipeline capacity to deliver inland North American crude oils to United States gulf coast markets increases and the belief that this should support better price realizations for SCO; and the expectation that the volatility in the SCO to WTI differential is likely to persist for several years until sufficient pipeline capacity to deliver crude oil from western Canada to Cushing, Oklahoma or the United States gulf coast is available. The factors or assumptions on which the forward-looking information is based include, but are not limited to: the assumptions outlined in the Corporation's guidance document as posted on the Corporation's website at www.cdnoilsands.com as of April 30, 2012 and as subsequently amended or replaced from time to time, including without limitation, the assumptions as to production, operating expenses and oil prices; the successful and timely implementation of capital projects; the ability to obtain regulatory and Syncrude joint venture owner approval; our ability to either generate sufficient cash flow from operations to meet our current and future obligations or obtain external sources of debt and equity capital; the continuation of assumed tax, royalty and regulatory regimes and the accuracy of the estimates of our reserves and resources volumes. You are cautioned that the foregoing list of important factors is not exhaustive. Furthermore, the forward-looking statements contained in this MD&A and the related press release are made as of April 30, 2012, and unless required by law, the Corporation does not undertake any obligation to update publicly or to revise any of the included forward-looking statements, whether as a result of new information, future events or otherwise. The forward-looking statements contained in this MD&A and related press release are expressly qualified by this cautionary statement. In this MD&A and the related press release, we refer to financial measures that do not have any standardized meaning as prescribed by Canadian GAAP. These non-GAAP financial measures include cash flow from operations, cash flow from operations on a per Share basis, net debt, total capitalization and net debt to total capitalization. In addition, the Corporation refers to various per barrel figures, such as net realized selling prices, operating expenses and Crown royalties, which also are considered non-GAAP measures. We derive per barrel figures by dividing the relevant sales or cost figure by our sales volumes, which are net of purchased crude oil volumes in a period. Non-GAAP financial measures provide additional information that we believe is meaningful regarding the Corporation's operational performance, its liquidity and its capacity to fund dividends, capital expenditures and other investing activities. Users are cautioned that non-GAAP financial measures presented by the Corporation may not be comparable with measures provided by other entities. 1 As reported in the Consolidated Statements of Cash Flows. Synthetic crude oil ("SCO") production from the Syncrude Joint Venture ("Syncrude") during the first quarter of 2012 totalled 26.8 million barrels, or 295,000 barrels per day, compared with the same 2011 period when production totalled 28.9 million barrels, or 321,000 barrels per day. Production in the 2012 first quarter was impacted by maintenance on Coker 8-1 while the 2011 first quarter was characterized by more reliable operations with no major maintenance. Coker 8-1 returned to service in April at full capacity rates. Net to the Corporation, production totalled 9.9 million barrels in the first quarter of 2012 compared with 10.6 million barrels in the first quarter of 2011, based on Canadian Oil Sands' 36.74 per cent working interest in Syncrude. Canadian Oil Sands' operating expenses in the first quarter of 2012 decreased about 17 per cent to $321 million, or $32.68 per barrel, from $387 million, or $35.53 per barrel, in the first quarter of 2011. The decrease is primarily due to decreased purchased energy costs reflecting lower natural gas prices in 2012, and reduced expense for Syncrude's long-term incentive plans. See the "Operating Expenses" section of this MD&A for further discussion. Canadian Oil Sands' capital expenditures in the first quarter of 2012 rose to $141 million from $109 million in the comparative 2011 quarter, as spending increased on large multi-year capital projects to replace or relocate four of Syncrude's five mining trains and to support Syncrude's tailings management plans. Additional information is provided in the "Capital Expenditures" section of this MD&A. 1 Cash flow from operations and cash flow from operations per Share are non-GAAP measures and are defined on page 5 of this MD&A. 2 The Corporation's sales volumes differ from its production volumes due to changes in inventory, which are primarily in-transit pipeline volumes.Sales volumes are net of purchases. 1 Unless otherwise specified, the per barrel measures in this MD&A have been derived by dividing the relevant item by sales volumes in the period. 2 Sales volumes, net of purchased crude oil volumes. Cash flow from operations decreased five per cent to $454 million, or $0.94 per Share, in the first quarter of 2012 from $478 million, or $0.99 per Share, in the first quarter of 2011. The decrease was due mainly to lower sales (net of crude oil purchases and transportation expense) and higher Crown royalties, partially offset by lower operating expenses. Sales net of crude oil purchases and transportation expense decreased $60 million to $956 million in the first quarter of 2012 from $1,016 million in the comparative 2011 quarter, reflecting lower sales volumes partially offset by a higher average realized selling price. Additional information is provided in the "Sales Net of Crude Oil Purchases and Transportation Expense" section of this MD&A. Crown royalties increased $25 million to $96 million, or $9.71 per barrel, in the first quarter of 2012 from $71 million, or $6.49 per barrel, in the first quarter of 2011 due primarily to an increase in estimated bitumen prices. Additional information is provided in the "Crown Royalties" section of this MD&A. Operating expenses in the first quarter of 2012 decreased about 17 per cent to $321 million, or $32.68 per barrel, from $387 million, or $35.53 per barrel, in the first quarter of 2011, primarily due to decreased purchased energy costs reflecting lower natural gas prices in 2012 and reduced expense for Syncrude's long-term incentive plans. See the "Operating Expenses" section of this MD&A for further discussion. Net income decreased by $3 million to $321 million, or $0.66 per Share, in the first quarter of 2012 from $324 million, or $0.67 per Share, in the first quarter of 2011, reflecting the variances in sales, Crown royalties and operating expenses described earlier. Capital expenditures in the first quarter of 2012 rose to $141 million from $109 million in the comparative 2011 quarter, as spending increased on large multi-year capital projects to replace or relocate four of Syncrude's five mining trains and to support Syncrude's tailings management plans. Additional information is provided in the "Capital Expenditures" section of this MD&A. Net debt, comprised of long-term debt less cash and cash equivalents, decreased to $0.1 billion at March 31, 2012 from $0.4 billion at December 31, 2011, as Canadian Oil Sands generated $454 million in cash flow from operations in the first quarter of 2012, exceeding capital expenditures and dividend payments of $141 million and $145 million, respectively. In addition, reductions in non-cash working capital increased cash and cash equivalents by $130 million. On March 29, 2012, the Corporation issued U.S. $400 million of 4.5% senior unsecured notes due April 1, 2022 and U.S. $300 million of 6.0% senior unsecured notes due April 1, 2042. With the proceeds from the debt issuance, cash and cash equivalents totaled $1.7 billion at March 31, 2012. Proceeds from the issues will be used to repay U.S. $300 million of senior notes which mature on August 15, 2013, fund major capital projects and support dividend stability. 1 Sales include sales of purchased crude oil and sulphur. 3 SCO sales net of crude oil purchases and transportation expense divided by sales volumes, net of purchased crude oil volumes. The $60 million, or six per cent, decrease in sales net of crude oil purchases and transportation expense in the first quarter of 2012 relative to the 2011 comparative quarter reflects lower sales volumes in 2012 partially offset by a higher average realized SCO selling price. Sales volumes averaged 108,000 barrels per day in the first quarter of 2012 compared with 121,000 barrels per day in the first quarter of 2011, mainly reflecting maintenance work on Coker 8-1 in 2012. The realized selling price in the first quarter of 2012 averaged $97.07 per barrel compared with $93.04 per barrel in the 2011 first quarter, reflecting a higher WTI crude oil price and a weaker Canadian dollar, partially offset by a SCO discount relative to WTI. WTI averaged U.S. $103 per barrel in the first quarter of 2012 compared with U.S. $95 per barrel in the first quarter of 2011, and the Canadian dollar averaged $1.00 U.S./Cdn in the first quarter of 2012, down from $1.02 U.S./Cdn in the first quarter of 2011. The Corporation realized a weighted-average SCO to WTI discount of $5.89 per barrel in the first quarter of 2012 versus a $0.35 per barrel premium in the first quarter of 2011. The decline of the SCO to WTI differential reflects recent supply/demand fundamentals for light crude oil. Increasing North American production of both SCO and light crude oil from tight oil formations and refinery modifications enabling processing of heavier crude oils have resulted in sales to more distant refineries, thereby decreasing the net realized price by higher transportation costs. More recently, this situation has been exacerbated by pipeline apportionment which has restricted the ability of SCO and other crude oils to reach their preferred markets, reducing the price received. More information on the SCO to WTI differential is provided in the "Outlook" section of this MD&A. The Corporation purchases crude oil from third parties to fulfill sales commitments with customers when there are shortfalls in Syncrude's production and to facilitate certain transportation and tankage arrangements and operations. Sales include the sale of purchased crude oil while the cost of these purchases is included in crude oil purchases and transportation expense. Crude oil purchases were higher in the first quarter of 2012 relative to the comparative 2011 quarter, reflecting additional purchased volumes in 2012 to support transportation and storage arrangements and unanticipated production shortfalls, as well as higher crude oil prices. Crown royalties increased $25 million to $96 million, or $9.71 per barrel, in the first quarter of 2012 from $71 million, or $6.49 per barrel, in the first quarter of 2011 due primarily to an increase in estimated bitumen prices. The Syncrude Royalty Amending Agreement requires that bitumen be valued by a formula that references the value of bitumen based on a Canadian heavy oil price adjusted for reasonable quality, transportation and handling deductions (including diluent costs) to reflect the quality and location differences between Syncrude's bitumen and the reference price of bitumen. Canadian Oil Sands' share of the royalties recognized for the period from January 1, 2009 to March 31, 2012 are estimated to be approximately $40 million lower than the amount calculated using the Alberta-government-provided bitumen value for Syncrude. The Syncrude owners and the Alberta government continue to discuss the basis for reasonable quality, transportation, and handling adjustments but if such discussions do not result in an agreed upon solution, either party may seek judicial determination of the matter. The cumulative impact of such discussions or judicial determination, as applicable, will be recognized immediately and will impact both net income and cash flow from operations accordingly. 1 Upgrading costs include the production and ongoing maintenance costs associated with processing and upgrading of bitumen to SCO. 2 Reflects energy generated by the upgrader that is used in the bitumen production process and is valued by reference to natural gas and diesel prices. Natural gas prices averaged $2.23 per GJ and $3.59 per GJ in the three months ended March 31, 2012 and 2011, respectively, and diesel prices averaged $0.93 per litre and $0.89 per litre in the three months ended March 31, 2012 and 2011, respectively. 3 Canadian Oil Sands' adjustments mainly pertain to actual reclamation costs and major turnaround costs, which Syncrude includes in operatingexpenses. Canadian Oil Sands capitalizes major turnaround costs and recognizes actual reclamation costs through its asset retirement obligation.Major turnaround costs are expensed through depreciation and reclamation costs are expensed through both depletion and accretion (within netfinance expense). a decrease in the value of Syncrude's long-term incentive plans in 2012 as opposed to an increase in 2011. A portion of Syncrude's long-term incentive plans is based on the market return performance of several Syncrude owners' shares, including those of the Corporation, which was stronger in 2011 than in 2012. Purchased energy consumption rates were higher in the first quarter of 2012 primarily because Coker 8-1, which underwent maintenance, generated less fuel for energy consumption than in the comparative 2011 period; as such, natural gas purchases were higher. Non-production expenses totalled $24 million in the first quarter of 2012 compared with $33 million in the first quarter of 2011. Non-production expenses consist primarily of development expenditures relating to capital programs, which are expensed, such as pre-feasibility engineering, technical and support services, research and development, evaluation drilling and regulatory and stakeholder consultation expenditures. Non-production expenses can vary from period to period depending on the number of projects underway and the development stage of the projects. Interest costs in the first quarter of 2012 were virtually unchanged from the comparative 2011 quarter; however, interest expense was lower in 2012 because a higher portion of interest costs were capitalized as cumulative capital expenditures on qualifying assets rose. As such, net finance expense decreased to $7 million in the first quarter of 2012 from $14 million in the first quarter of 2011. Depreciation and depletion expense totalled $95 million in the first quarters of 2012 and 2011 as Canadian Oil Sands' depreciable property, plant and equipment, and the estimated useful lives over which most of these assets are depreciated, remained largely unchanged. Foreign exchange gains/losses are primarily the result of revaluations of our U.S. dollar denominated long-term debt caused by fluctuations in U.S. / Cdn dollar exchange rates. The foreign exchange gains on long-term debt in the first quarter of 2012 were the result of a strengthening in the value of the Canadian dollar relative to the U.S. dollar from $0.98 U.S./Cdn at December 31, 2011 to $1.00 U.S./Cdn at March 31, 2012. Similarly, the gains in the first quarter of 2011 were the result of a strengthening in the value of the Canadian dollar from $1.01 U.S./Cdn at December 31, 2010 to $1.03 U.S./Cdn at March 31, 2011. The Corporation recorded a $100 million deferred tax expense in the first quarter of 2012, down from $103 million in the first quarter of 2011, reflecting lower before-tax earnings in 2012. Canadian Oil Sands decreased its estimated asset retirement obligation during the first quarter of 2012 from $1,037 million at December 31, 2011 to $940 million at March 31, 2012. The decrease reflects an increase in the risk-free interest rate used to discount future reclamation payments combined with $43 million of reclamation spending during the first quarter of 2012. A $29 million current portion of the asset retirement obligation is included in accounts payable and accrued liabilities, while the $911 million non-current portion is separately presented as an asset retirement obligation on the March 31, 2012 Consolidated Balance Sheets. (2) Cash flow from operations and cash flow from operations per Share are non-GAAP measures and are defined on page 5 within this MD&A. beginning in the first quarter of 2011, net income reflects an increase in deferred taxes following the December 31, 2010 conversion from a income trust to a corporation. Under the corporate structure, tax pools are being drawn down to shelter taxable income, resulting in deferred tax expenses whereas, as a trust, distributions were available to shelter taxable income. net income was higher in the fourth quarter of 2010 due to a $269 million deferred tax recovery resulting from re-measuring the deferred tax liability at a lower tax rate upon conversion to a corporation on December 31, 2010. Quarterly variances in net income and cash flow from operations are caused mainly by fluctuations in crude oil prices, production and sales volumes, operating expenses and natural gas prices. Net income is also impacted by unrealized foreign exchange gains and losses, depreciation and depletion, and deferred tax amounts. The dividends paid to Shareholders are likewise dependent on the factors impacting cash flow from operations as well as the amount and timing of capital expenditures. While the supply/demand balance for crude oil affects selling prices, the impact of this relationship has not displayed significant seasonality. Natural gas prices are typically higher in winter months as heating demand rises, but this seasonality is influenced by weather conditions and North American natural gas inventory levels. In addition, recent technological developments in North American natural gas production have significantly increased production levels and reduced natural gas prices. These conditions may persist for the next several years. Syncrude production levels may not display seasonal patterns or trends. While maintenance and turnaround activities are typically scheduled to avoid the winter months, the exact timing of unit outages cannot be precisely scheduled, and unplanned outages may occur. The costs of major turnarounds are capitalized as property, plant and equipment and depreciated over the period until the next scheduled turnaround. The costs of all other turnarounds and maintenance activities are expensed in the period incurred, which can result in volatility in quarterly operating expenses. All turnarounds and maintenance activities impact per barrel operating expenses because sales volumes are lower in the periods when this work is occurring. the Centrifuge Tailings Management project, which accounted for $7 million of the capital spent in the first quarter of 2012 ($nil in the first quarter of 2011). This project involves the construction of a centrifuge plant at the Mildred Lake mine to process tailings in support of Syncrude's reclamation efforts. capitalized interest costs, which were $20 million in the first quarter of 2012 compared with $11 million in the first quarter of 2011, reflecting higher cumulative capital expenditures on qualifying assets in 2012.
capitalized turnaround costs, which were $7 million in the first quarter of 2012 ($nil in the first quarter of 2011), reflecting purchases of materials in advance of the Coker 8-3 turnaround scheduled for the second quarter of 2012. The remaining capital expenditures, which accounted for $30 million and $39 million of the capital spent in the first quarters of 2012 and 2011, respectively, related to regular maintenance of business and other investment activities, including relocation of tailings facilities and other infrastructure projects. More information on Canadian Oil Sands' major capital projects is provided in the "Outlook" section of this MD&A. During the first quarter of 2012, Canadian Oil Sands entered into new contractual obligations totalling approximately $340 million for the transportation and storage of crude oil; assumed $130 million in new funding commitments primarily related to the major capital projects discussed in the Outlook section of this MD&A; increased its funding commitment by $120 million in respect of Syncrude Canada's registered pension plan; and assumed $50 million in new commitments related to Syncrude Canada's employee retention program. On April 30, 2012, the Corporation declared a quarterly dividend of $0.35 per Share for a total dividend of approximately $170 million. The dividend will be paid on May 31, 2012 to Shareholders of record on May 25, 2012. With continued strength in oil prices, a growing cash position, and reduced liquidity risk as a result of the recent debt issue, Canadian Oil Sands has confidence in its ability to execute its business plan and support a higher dividend level, while maintaining a strong balance sheet. Dividend payments continue to be set quarterly by the Board of Directors in the context of current and expected crude oil prices, economic conditions, Syncrude's operating performance, and the Corporation's capacity to finance operating and investing obligations. Dividend levels are established with the intent of absorbing short-term market volatility over several quarters. Dividend levels also recognize our intention to fund the current major projects with cash flow from operations and the planned increase in net debt levels, while maintaining a strong balance sheet to reduce exposure to potential oil price declines, capital cost increases, or major operational upsets. 1Net debt, total capitalization, and net debt to total capitalization are non-GAAP measures. 2Long-term debt less cash and cash equivalents. 3Net debt plus Shareholders' equity. 4Net debt divided by total capitalization. Net debt, comprised of long-term debt less cash and cash equivalents, decreased to $0.1 billion at March 31, 2012 from $0.4 billion at December 31, 2011, as COS generated $454 million in cash flow from operations in the first quarter of 2012, exceeding capital expenditures and dividend payments of $141 million and $145 million, respectively. In addition, a reduction in non-cash working capital balances increased cash and cash equivalents by $130 million. Shareholders' equity increased to $4.4 billion at March 31, 2012 from $4.2 billion at December 31, 2011, as net income exceeded dividends in the first quarter of 2012. On March 29, 2012, Canadian Oil Sands issued U.S. $400 million of 4.5% senior unsecured notes due April 1, 2022 and U.S. $300 million of 6.0% senior unsecured notes due April 1, 2042 (collectively, the "Notes"). Interest on the Notes is payable semi-annually on April 1 and October 1. Proceeds from the issues will be used to repay U.S. $300 million of senior notes which mature on August 15, 2013, fund major capital projects over the next three years and support dividend stability. Canadian Oil Sands has a $1,500 million operating credit facility which expires on June 1, 2015 and a $40 million extendible revolving term credit facility which expires on June 30, 2013. No amounts were drawn against these facilities at March 31, 2012. COS' senior notes indentures and credit facility agreements contain certain covenants which restrict Canadian Oil Sands' ability to sell all or substantially all of its assets or change the nature of its business, and limit total debt to total capitalization to 55 per cent. A significant increase in debt or decrease in Shareholders' equity would be required before covenants restrict the Corporation's financial flexibility. Our liquidity position has improved in the first quarter of 2012 as a result of our growing cash position and the issuance of debt. We expect cash levels to decrease significantly over the next several years as we fund the major capital projects and repay the 2013 debt maturity. As a result, net debt levels should rise to a more normalized level of $1 billion to $2 billion by the end of 2014, coincident with reduced risk from the completion of our major capital projects. The Corporation's shares trade on the Toronto Stock Exchange under the symbol COS. The Corporation had a market capitalization of approximately $10 billion with 484.5 million shares outstanding and a closing price of $21.04 per Share on March 31, 2012. The following table summarizes the trading activity for first quarter of 2012. The Corporation's financial instruments include cash and cash equivalents, accounts receivable, reclamation trust investments, accounts payable, accrued liabilities and long-term debt. The nature, the Corporation's use of, and the risks associated with these instruments are unchanged from December 31, 2011. The Corporation did not have any financial derivatives outstanding during the first quarter of 2012. There were no new accounting policies adopted, nor any changes to accounting policies, in the first quarter of 2012. Canadian Oil Sands has reduced its single-point 2012 Syncrude production estimate by 3 million barrels to 110 million barrels (40.4 million barrels net to Canadian Oil Sands) or 301,000 barrels per day (111,000 barrels per day net to Canadian Oil Sands). The 2012 Syncrude production range has been narrowed to 106 to 114 million barrels. The 110 million barrel Syncrude production outlook incorporates actual first quarter 2012 production, a 60-day planned turnaround of Coker 8-3 during the second quarter of the year, and an allowance for unplanned outages. The revised outlook assumes a $90 per barrel plant-gate realization, based on a U.S. $100 per barrel WTI oil price and a $10 per barrel SCO discount to Cdn dollar WTI. The estimated WTI price reflects an anticipated narrowing of the discount relative to Brent oil prices as pipeline capacity to deliver inland North American crude oils to United States gulf coast markets increases; this should support better price realizations for SCO, as it should track the improvement in WTI prices relative to world oil prices. The estimated SCO discount to WTI reflects recent supply/demand fundamentals for inland North American light crude oil. Increasing North American production of both SCO and light crude oil from tight oil formations, and refinery modifications enabling processing of heavier crude oils, have pushed light crude sales to more distant refineries, thereby increasing transportation costs included in the net realized price. Recently, this situation has been exacerbated by pipeline apportionment which has restricted the ability of SCO and other crude oils to reach their preferred markets, reducing the price received. These supply and demand dynamics lead to price volatility which is likely to persist for several years until sufficient pipeline capacity to deliver crude oil from western Canada to Cushing, Oklahoma or the United States gulf coast is available. We estimate 2012 operating expenses of $1,529 million, or $37.83 per barrel, reflecting a natural gas price assumption of $3.00 per gigajoule and increased purchased diesel costs. The estimate for 2012 capital expenditures has decreased by $241 million to $1,219 million due to adjustments to the expected timing of major project spending. The expected completion dates and estimated costs for the major projects are not affected. Estimated interest costs have increased to $108 million, reflecting the U.S. $700 million of debt issued in March, with capitalized interest costs estimated at $75 million. Canadian Oil Sands is estimating 2012 cash flow from operations of $1,641 million, or $3.39 per Share. After deducting forecast 2012 capital expenditures, we estimate $422 million in remaining cash flow from operations for the year, or $0.87 per Share. We expect cash levels to decrease significantly over the next several years as we fund the major capital projects and repay the 2013 debt maturity. As a result, net debt levels should rise to a more normalized level of $1 billion to $2 billion by the end of 2014, coincident with reduced risk from the completion of our major capital projects. 12012 cash flow from operations sensitivities are not expected to be significantly impacted by income taxes; however, in 2013, Canadian Oil Sandsexpects to record current taxes of approximately $400 million. The following tables provide cost and schedule estimates for Syncrude's major projects. Costs for the Centrifuge Tailings Management project at the Mildred Lake mine are included in 2012 spending but are excluded from 2013 and 2014 spending as this project has not reached sufficient design definition. Regular maintenance capital costs post 2012 will be provided on an annual basis with the budget for the following year, and are currently estimated to average approximately $10 per barrel over the next few years. (1) Major projects spending includes costs for Mildred Lake Mine Train Replacement, Aurora North Mine Train Relocation, and Aurora North Tailings Management projects. Costs for the Centrifuge Tailings Management project are included in 2012 spending but are excluded from 2013 and 2014 spending, as this project has not reached sufficient design definition. (2) Major projects costs include both capital expenditures, excluding capitalized interest, and certain non-production expenses. Construction on the SER project was essentially complete at the end of 2011 at a cost of approximately $1.5 billion (gross to Syncrude). The project is expected to be in service in the second half of 2012. Canadian Oil Sands plans to finance these major projects with cash flow from operations and the planned increase in net debt levels. The major projects tables contain forward-looking information and users of this information are cautioned that the actual yearly and total major project costs and the actual in-service dates for the major projects may vary from the plans disclosed. The major project cost estimates and major project target in-service dates are based on current spending plans. Please refer to the "Forward-Looking Information Advisory" section of this MD&A for the risks and assumptions underlying this forward-looking information. For a list of additional risk factors that could cause the actual amount of the major project costs and the major project target in-service dates to differ materially, please refer to the Corporation's Annual Information Form dated February 23, 2012 which is available on the Corporation's profile on SEDAR at www.sedar.com and on the Corporation's website atwww.cdnoilsands.com. The Corporation indirectly owns a 36.74 per cent interest ("Working Interest") in the Syncrude Joint Venture ("Syncrude"). Syncrude is involved in the mining and upgrading of bitumen from oil sands in Northern Alberta. The Syncrude Project is comprised of open-pit oil sands mines, utilities plants, bitumen extraction plants, and an upgrading complex that processes bitumen into Synthetic Crude Oil. Each joint-venture owner, including the Corporation, takes its proportionate share of production in kind, and funds its proportionate share of Syncrude's operating and capital costs on a daily basis. Syncrude Canada Ltd. ("Syncrude Canada") operates Syncrude on behalf of the joint-venture owners and is responsible for selecting, compensating, directing and controlling Syncrude's employees, and for administering all related employment benefits and obligations. The Corporation's investment in Syncrude and Syncrude Canada represents its only producing asset. The Corporation's office is located at the following address: 2500 First Canadian Centre, 350 – 7th Avenue S.W., Calgary, Alberta, Canada T2P 3N9. These unaudited interim consolidated financial statements are prepared and reported in Canadian dollars in accordance with Canadian generally accepted accounting principles as set out in the Handbook of the Canadian Institute of Chartered Accountants ("CICA Handbook"). The CICA Handbook incorporates International Financial Reporting Standards ("IFRS") and publicly accountable enterprises, like the Corporation, are required to apply such standards. These unaudited interim financial statements have been prepared in accordance with IFRS applicable to the preparation of interim finanacial statements and International Accounting Standard ("IAS") 34, Interim Financial Reporting, and the accounting policies applied in these interim unaudited consolidated financial statements are based on IFRS as issued, outstanding and effective on April 30, 2012. The same accounting policies and methods of computation are followed in these unaudited interim consolidated financial statements as compared with the most recent audited annual consolidated financial statements for the year ended December 31, 2011. (1) Reclassifications are primarily transfers from Construction in progress to other categories of property, plant and equipment when construction is completed and assets are available for use. For the three months ended March 31, 2012, interest costs of $20 million were capitalized and included in property, plant and equipment (three months ended March 31, 2011 – $11 million) based on a 7.3 per cent interest capitalization rate (three months ended March 31, 2011 – 7.3 per cent). On March 29, 2012, the Corporation issued U.S. $400 million of 4.50% unsecured Senior Notes, maturing April 1, 2022. Interest is payable on the notes semi-annually on April 1 and October 1. On March 29, 2012, the Corporation issued U.S. $300 million of 6.00% unsecured Senior Notes, maturing April 1, 2042. Interest is payable on the notes semi-annually on April 1 and October 1. The new Senior Notes are unsecured, rank pari passu with other senior unsecured debt of the Corporation, and contain certain covenants that place limitations on the sale of assets and the granting of liens or other security interests. The Corporation and each of the other Syncrude owners are liable for their share of ongoing environmental obligations related to the ultimate reclamation of the Syncrude properties on abandonment. The Corporation estimates reclamation expenditures will be made over approximately the next 70 years and has applied a risk-free interest rate of 2.75 per cent at March 31, 2012 (December 31, 2011 – 2.50 per cent) in deriving the asset retirement obligation. The risk-free rate is based on the yield for benchmark Government of Canada long-term bonds. The decrease in the asset retirement obligation from $1,037 million at December 31, 2011 to $940 million at March 31, 2012 reflects an increase in the risk-free interest rate used to discount future reclamation payments and reclamation spending, partially offset by the accretion of the discounted liability. The total undiscounted estimated cash flows required to settle the Corporation's share of the asset retirement obligation was $2,167 million at March 31, 2012 (December 31, 2011 – $2,210 million). (1) Net debt, total capitalization, and net debt to total capitalization are non-GAAP measures. (2) Long-term debt less cash and cash equivalents. (3) Net debt plus Shareholders' equity. (4) Net debt divided by total capitalization. Net debt, comprised of long-term debt less cash and cash equivalents, decreased to $0.1 billion at March 31, 2012 from $0.4 billion at December 31, 2011, as Canadian Oil Sands generated $566 million in cash from operating activities in the first quarter of 2012 (including $112 million from a reduction in operating non-cash working capital balances), exceeding capital expenditures and dividend payments of approximately $141 million and $145 million, respectively. In addition, a reduction in investing non-cash working capital balances increased cash and cash equivalents by $18 million. Shareholders' equity increased to $4.4 billion at March 31, 2012 from $4.2 billion at December 31, 2011, as net income exceeded dividends in the first quarter of 2012. As disclosed in Note 5 to these interim consolidated financial statements and Notes 9 and 10 to the 2011 annual consolidated financial statements, the Corporation is bound by certain debt covenants; however, these covenants do not specifically limit the Corporation's ability to pay dividends. The Corporation monitors its total debt-to-total capitalization, as it must be less than 55 per cent according to certain financial covenants. With a net debt-to-total capitalization of two per cent at March 31, 2012, the Corporation is well within its limits and a significant increase in debt or decrease in equity would be required to negatively impact the Corporation's financial flexibility. Commitments are summarized in Canadian Oil Sands' 2011 annual consolidated financial statements and include future cash payments that the Corporation is required to make under existing contractual arrangements entered into directly or as a 36.74 per cent owner in Syncrude. During the first quarter of 2012, Canadian Oil Sands entered into new contractual obligations totalling approximately $340 million for the transportation and storage of crude oil; assumed $130 million in new funding commitments relating to major capital projects; increased its funding commitment by $120 million in respect of Syncrude Canada's registered pension plan; and assumed $50 million in new commitments related to Syncrude Canada's employee retention program. Crown royalties include amounts due under the Syncrude Royalty Amending Agreement with the Alberta government. The Syncrude Royalty Amending Agreement requires that bitumen be valued by a formula that references the value of bitumen based on a Canadian heavy oil price adjusted for reasonable quality, transportation and handling deductions (including diluent costs) to reflect the quality and location differences between Syncrude's bitumen and the reference price of bitumen. Canadian Oil Sands' share of the royalties recognized for the period from January 1, 2009 to March 31, 2012 are estimated to be approximately $40 million lower than the amount calculated using the Alberta-government-provided bitumen value for Syncrude. The Syncrude owners and the Alberta government continue to discuss the basis for reasonable quality, transportation, and handling adjustments but if such discussions do not result in an agreed upon solution, either party may seek judicial determination of the matter. The cumulative impact of such discussions or judicial determination, as applicable, will be recognized immediately and will impact both net income and cash from operating activities accordingly. Income taxes and interest payments are included within cash from operating activities on the Consolidated Statements of Cash Flows.